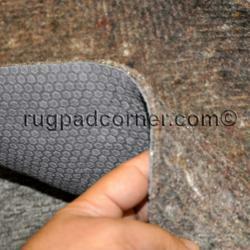 Rug Pad Corner announces that its felt rug pads area rated as safe for radiant heated floors. The rug pads will not stick to the floor and will allow for the transfer of heat. A close look will show the detail in the felt and rubber surfaces of Ultra Premium. This is perhaps one of the only felt and rubber rug pads that is designed not to damage heated floors. Rug Pad Corner, the nation's source for quality rug pads, announces that its felt rug pads are rated as safe for all radiant heated floors. Ultra Premium and Superior rug pads are proven to be safe for all heated floors. "We manufacture our felt rug pads so that they do not contain any of the elements that can harm a radiant heated floor", states Sam of Rug Pad Corner. "Most rug pads out there will actually melt themselves onto a heated floor, causing thousands of dollars worth of damage." Sam continues to state that Ultra Premium and Superior felt rug pads are manufactured without the use of chemicals, adhesives or glues, some of the more common materials that cause rug pads to stick to heated floors. Rug Pad Corner has full control of the production of its rug pads. The rug pads are made in the USA of materials that pass strict quality standards. The felt in both rug pads goes through an extra process unlike that of any other rug pad. Here, the process of heat pressing the felt to keep it together and compact eliminates the process of adhesives that other rug pads contain. The intense heat actually mends the felt together, making it very tight and compact. Since there are no adhesives involved, there is no chance of anything melting onto the heated floor. As for the rubber in the Ultra Premium, here again, there are no adhesives or glues. The natural rubber is heat pressed to the felt. And, since it is real rubber, it does not melt to the radiant heated floor. "As for allowing the heat to pass through the rug pad to the rest of the room, that is not a problem, as our rug pads are porous", comments Sam. With both Ultra Premium and Superior, heat is able to pass through the rug pad and perform as it is supposed to. Other pads may block the heat because of the layers of glues or adhesives within the rug pads. This layer of glue is a two fold problem in that it may end up stuck to the floor and it blocks any heat transfer from the floor to the room. Rug Pad Corner offers rug pads for radiant heated floors through safe and secure online shopping. All rug pads are cut to size and shipped for free within the contiguous United States.